Update:As of January 2013, Love Balls is currently at 2906 Fruth St.
My visit to Love Balls was part of the Central TX BBQ Run. After a second day of driving about the Austin area sampling barbecue, and then washing down that barbecue with more Blizzards from the Lockhart, TX Dairy Queen, we again decided that, after a modest afternoon siesta, it was time to go seek out more food carts in Austin. 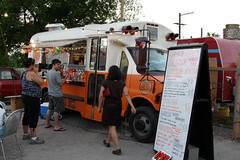 After checking out the nice map on Austinfoodcarts.com, we decided to check out some of the trailers along South Congress. So we piled into the cars and headed out. Alas, while we saw our desired street carts, the traffic was intractable due to the LoneStar Roundup Car and Custom show. So we ended up heading over the river, and then east of I-35, eventually finding what’s known as the “Eastside Drive-In” court of food carts, with eight or nine trailers all clustered around a central courtyard of tables, most of them makeshift affairs made from wire spools and packing crates. But this court had several intriguing food carts, ranging from the Vegan Yacht (which, for several members of our group was a welcome change of pace after two days of barbecue), to a Fish and Chips trailer (Bits and Druthers, more on that later), to Japanese fritters (Love Balls Japanese Street Food). The last of these was the first to catch my eye, so I wandered over. 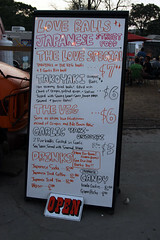 Love Balls is actually a pretty minimalistic food cart, having essentially three different menu items: Takoyaki (little octopus fritters fried up on the little Robata grill in the cart), Veggie Love Balls (which were essentially the same item made with mushrooms instead of octopus, and omitting the katsuo flakes from the topping, and garlic rice balls (the last of which were sold out). While the takoyaki looked quite enjoyable (and it was, my friend Brad got some later in the evening), those that know me also know that seafood and I don’t get along very well (in the risky allergy way), so I decided that the Veggie Love Balls were the order of the evening. Despite taking a bit longer than I would have liked (they apparently had propane issues and had to switch tanks), it wasn’t that long before I had a nice assortment of little veggie fritters in front of me. These were nice little pancake-style fritters: a nice core of marinated mushrooms, surrounded by a layer of nicely fried rice-flour batter, topped with grated ginger, a savory brown sauce, and some of the famous-but-slightly-disturbing Kewpie Mayo. The result was rather pleasant, with a nice crispy fritter, a good combination of savory and spicy sauces, and a little pocket of explosion as you hit the inside of the fritter. I rather enjoyed these. 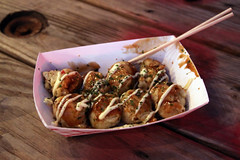 If I’m back in the area, I’ll have to search them out again to try the garlic balls and the takoyaki. I used to cook these in summer carnivals back home. Well the standard takoyaki anyway. You’re having way too much fun in Austin. I MUST visit one of these days… Thanks for all the sharing.